When you go to see musicals and plays, the intent (in my opinion) is to generate emotions. Feelings you can relate to, hold on to, that stirs within you during and after you leave the performance. From this rehearsal I photographed, I believe the cast of "Leaving Iowa" at the Towle Theater, and the writers and director, have done just that. Perhaps more. This year has been an exciting year for me because of the Towle Theater. These musicals and plays were the first ever for me to photograph. So I will always remember this year. Each rehearsal I photographed was unique. "Leaving Iowa" was that, however when I walked away there was something very lasting about the experience, even though I photographed just the rehearsal. When you watch a performance you can get pumped up with the music, the vocals, the energy from the cast. This is all inspiring and immediate. When you go home you can talk about it, relive it to some extent, and it eventually wears off. Tonight's rehearsal seemed different to me. A nerve deep inside was touched. One that seems to be lasting. What that was, or is for me, were the childhood memories I had of being with my family on trips. These are the memories that will always be with me. They are the happy ones, funny ones. Though some memories may have been sad or unhappy the time they occurred, the remembrance seems to smooth all that out into a joyful journey. And yes . . . SPOILER ALERT!!! If you have not seen the play yet, I strongly encourage you to do so first. This blog of my experience is never a substitute for your own experience. 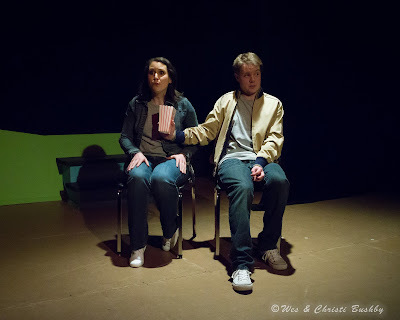 So now, let me take you on a photographic journey of this play starting with photos of the cast . . . Setting: Dad passed away about a year ago. Don is a bit uneased that nothing has been done with Dad's ashes. Living now in Boston, Don decides to go see his Mom and Sis, to get the ashes and to take them where Don believes Dad would have wanted. As Don drives with his Dad's ashes, there are flashbacks to the family vacation - memories from his past. To help you through the photos, Don who is telling this story to us has a cap on for when he and his Sis were kids. The cap is off for the present (as an adult). As you watch the play this is apparent, however with just photos being shown it may not be so obvious. This is also how the play pauses (taking off the hat), to allow Don to talk to us in the preset, as he reflects on his memories of the current scene. Again, this works well in the play. Your challenge is to keep up with the photos. Have you ever fallen asleep driving? I have. Did you ever see your dad falling asleep while driving on a trip? As a child I did not, probably because I fell asleep first. Though I do have those remembrances of suddenly waking up, and sometimes rolling to the car floor! So the above photos are familiar to me. This scene was pretty funny too, because the lighting would dim as Dad dozed off, light back up when he woke himself, then almost all the way out when he fell asleep. Just to be rudely awaken by another sleep truck drive who honks his horn in his sleep . . . as Dad tells it. Now remember the above photo. This scene has some meaning, other than at this point in time of the play. Sis, taunting Don, with the lucky arrow head she took from him when they were kids. So, Don leaves on his journey with Dad, leaving Mom and Sis to deal with his aunt and uncle that stop by to visit. I enjoyed that Dad was in the shadows, as Don went on his journey, reliving some of his past, talking to Dad in the urn. It made me feel Dad IS looking over my shoulder, always listening. Did you ever have a family vote? Not in my family, probably because there were three siblings. For Don and Sis, they can vote together all they wanted, however . . .
Dad always seemed to approach Mom with a lead phrase that would suggest this is what they were going to do, so Mom would say great (voting when she was not aware she was voting). Dad would win the election. Oh, on ties, the parents win! So, as kids, you wanted a "fun" vacation, a "fun" trip. After all, your friends and their families had fun at the cool places they went to, like Vegas. Dad, however, likes adventures and avoids the expense of tourist traps. So instead, You are going to Hannibal Missouri. You pout as Mom explains that Dad works hard all year for this, and this is his time to enjoy. Sis is somewhat okay with it, as long as there is a promise of a pool. And if you did not cooperate . . . hide your ears . . . So you are off . . . Dad with camera in hand, and you and Sis with books to read to keep you out of trouble . . . sort of. I have put "you" in this, because that is how I felt during the play. As Don drives to where he believes he can leave Dad's ashes, Don continues to talk to Dad (the urn) about all the memories from vacation. As a child you see the simple things in life. You do not know enough to make it complicated. So one of your remembrances may be like Don's family, specifically Dad, stopping to read this small post stuck in the ground in the middle of nowhere. "To think, we might have missed this" Dad says to the family, then wanting to take a family picture. You could tell it meant a lot to Dad to have the photo taken (and you did not have a choice). As a little extra incentive, to get you in the mood of a photo, "it's for grandma!". You do not realize until later in life, these memories are what you will have your whole life, to enjoy. What was really cool during the play, and not available during rehearsal, was when a photo was taken of the family. Each time the cast took a photo, the photo flashed up on the screen, with everyone in the photo dropped in on a background. I thought his was very cool, and so did the audience. During rehearsal I tried to photograph the the cast taking the photos, however, the contrast in stage lighting washed out half the images, so I did not publish them in this blog. And, the family always had to stop off to see things. In this scene, Don and Sis had to pick apples, and check for "no worms". And as siblings, there were always arguments (at least in my case). On the trip, Dad asked the kids a history question. When they did not want to play along, Dad offered a nickle to whomever correctly answered first. In this case both Don and Sis answered at the same time, however Sis got the nickle and tormented Don over it. Dad would always control the situation . . .
Dad also enjoys the little things in life like this - "Oh look kids . . . look what's up ahead . . . do you see it . . .
". . . an Alaskan license plate!" And Dad goes on to ponder all the miles driven and which way they may have come down from Alaska. Both Don and his Sis, whenever they could not go to where They wanted to on a trip, would want to go see their grandparents. I can relate to that. I wanted to go to my grandmothers, because she made the best treats. And, what was really fun, was my cousins lived out there too. So I had a full day playing, climbing silos, barns, trees, riding tractors, and in my case to also go up in airplanes. Don and Sis enjoyed going for similar reasons. I believe the fun was, you got to do things you never did otherwise, which is normal on a farm, but not in your everyday life. And here, the grandparents looked like someone from "Green Acres". Which by the way, on trips I took by myself to locations for business, I remember passing a farm named Green Acres several times. That too brought up not just the fun watching the name sake show on TV, but also my childhood playing with my cousins. It was a blast!!!! When Don arrives to where his grandparents had once lived, he found it was no longer there, and that a grocery store was now built where the house was. What I liked about the entire play was the use of the slides to help you identify where the character was. Now, get ready for "the slope" . . .
You need to watch out for these runaway carts, because there is a slope, a slope, watch out for the slope, don't stand on the slope! Got it? Yes, we got it, however it was indeed funny how it was repeated, as if it was the most important thing in the world. You understand Don's dilemma seeing a store where the house use to be, and feel his anxiety as to what he was going to do. He did not care about any "slope". However, the play also had you see the importance of other's lives outside yours. Yes, sometimes much simpler from your perspective. However to them, more real and important. Myself, during my travels I do see people and how they participate in their setting. As an observer looking in, it is interesting the different values people place on things. It is not wrong at all, just different. Understanding these differences brings us closer to reality, to enjoyment. This is what I believe Don's dad was doing throughout this play . . . the point he was trying to get across. So Don, not knowing what to do, knowing he has to think of something, and knowing he will be late getting back to Moms, calls to talk to her. Obviously, at least to Don, he could not tell Mom the house was no longer there. So he does not tell her the house has been replaced by a store, and does tell her he still has Dad with him. Another memory this play brought out, is how often we look back and say, "I wish I . . .". As Don drives and tries to figure out what to do with Dad, he remembers back when his Dad retired, and that all he did was to give a call home to say hi to Dad, after the retirement party. Not much is said between Don and Dad, as I believe happens in most families. Much of our reasoning focuses around ourselves at that moment, not others. "I have to pay attention to my life" is somewhat how we think. Not realizing our life if made up from the lives of others. Recognizing how you got to where you are now, can put some peace in our lives. At the beginning of the play, the family was lost on the road. Now we are back to that point. Dad sees a farmhouse and goes to see if he can find out where they are. The kids work themselves up into a scare with "what ifs", while Mom calms them down. This is where the "lucky arrow" comes from, that Don, as an adult, no longer thinks is lucky. Don has the chance to stop and see an old friend, to explain his predicament to. I enjoyed this part with Woman 2. One of the many faces . . . as it were . . . This is a funny, and probably a familiar scene from our own lives. The family is now in Hannibal Missouri, and the parents each have a place they want to go. So the kids split up. Sis chooses to go with Dad, and Don with Mom. Don believes he has gotten away from the torture of a boring tour through the cemetery with Dad. So Don is taken off by Mom to go look at antiques . . . and end up talking to some Amish people. However, circumstances changed Dad's plans, and Dad and Sis ended up watching an exciting fire rescue, went go-cart riding, and had ice cream. As Don listened to Sis, you can see the expression on him, "no way . . . why always me!". Dad and Don then go to a civil war museum, where Dad raises his hand as a volunteer, and Don not wanting to be embarrassed tries to pull Dad's arm down. The great pass . . . ever have a contest to pass another vehicle? Everyone is scared but Dad . . . Mom's turn to drive, and Dad is interfering . . . sound familiar? Maybe? In my case my dad always did the driving when we were out as a family. And, Dad becoming the non-driver tirade with another driver, reaches over and lays on the horn. This was a really funny, slow motion, fiery red scene showing Dad laying on the horn . . . not laying down to take it from anybody. And Mom, being the driver in command, not taking it from Dad. So Dad ends up in the dog house. Back to now, Don could not get the car started. Even using all the tricks Mom told him to use before he left. So Don now has the car in a garage to be fixed, and decides to go to a motel to get some rest, and something to eat. Now realize, Woman 1 and Woman 2 get a workout in this play, running around the outside of the stage, changing, getting into character, and rolling props out onto the stage. As in most families, the boys are to be stand up men, and whatever the problem between siblings, it is always the boys fault. At least so it seams to Don (and in my personal life). However, in this scene the kids want to go to Ghost Caverns. They make all kinds of promises that Dad is appreciative of, however the answer is still no . . . until . . . Sis does her charm on Dad and Dad changes his mind. Though Don and Sis are always at odds, Don has to admire the way Sis gets the job done. The kids are dancing to the good news and to the music in the background. This is where I like how playwrights and director take you out of the scene for just a split second, to give you a short break, before they bring you back in. In this next photo Dad looks up at the sound booth and gives the signal to "cut the music". It was a bit too joyful, knowing that Dad has given in to the kids. Of course these large signs keep popping up telling you were to turn. It is obvious. Even the kids agree it is that obvious. However Dad being in control, needs to be sure he is using the "free" parking lot, and passes the actual turn. Ending up on a trail instead of staying on the road. After the ranger re-directs, the family vote comes once again. Do we drive "all the way back", or do we pull over here and take the trail as the ranger suggested? Dad, always liking an adventure, and with a little help from Mom on the family vote, hit the trail singing the Browning (their last name) pep song. Back to the current setting, Don is grabbing some coffee and a bite to eat while he waits for the car to get fixed. At this point he looks like he has given up trying to find a place for Dad. This is where Woman 1 kicks it in. Your typical loving gabby greasy spoon restaurant stereotype waitress. Gotta love her. Through all the ruckus, Woman 1 unknowingly helps Don with what to do with Dad . . .
"Come stand in the center of your country - Lebanon, KS." This is the flyer the waitress is saying to do, something that is all touristy. Something that Don knows Dad would have never done. However there was still something "right" about this. Then Don remembers . . .
During their family trip back from Hannibal Missouri, Dad kept seeing signs about the center of your country. This is how they became "slightly off" (lost) at the beginning of the play, Dad making a decision to find this place while the family was asleep. So Don, looking a bit like a crazy man, cancels his meal and thanks everyone for the solution for Dad. With the car fixed, Don heads out to the center of the country. There is a bit of confusion as to the center, however it is there, on a pig farm. Here, Don lays Dad to rest, which ties back to the earlier part of the play that I asked you to remember the photograph. So as we flash back to when they were "out of their way", Dad took it to a vote to find out if the family would go along with Dad to check out something interesting . . . the center of the country. As the vote came around, Mom sided with the kids for the first time, to go straight back home. Reluctantly, and very sadly, Dad did just that. Don went with the farmer to the "pole" that had the inscription of the center of the country. Similar to the earlier stop the family made when Don and Sis were kids, reading an inscription on a pole that Dad found most interesting. During the walk, Don learned a little about the farmers father, the admiration he had, and what the farmer had to remember his father by. Throughout this entire scene I believe the audience felt the mood, the remembrance in our own lives. Don was left to do what he came to do. Leave Dad in a fitting place. One that Dad would be proud of, one that his son took the time to remember the experiences that Dad had grown to love. This was the last performance at the Towle Theater for the 2012 season. Though it might not have been the most technical, the most dramatic, the most "who done it", it Was the most human, comical, and interweaving play of our own lives that made this perhaps the best performance of this season. Thanks to the writers who wrote the play, John Buranosky who directed this play, and the actors. Lastly, I also thank whomever decided to put this on at the end of the season. Well done!!!! This play held a lot of fond memories for everyone. I say that because after the play, I saw and heard the audience talking about their vacations, their past childhood, all in good spirits and laughter. Everyone went away re-connected to their own lives, and of all things, energized ! Much has to do with the play. It is very human, very comical. The cast performed it very well, very human and very comical. Tom Farley who played Don, had a great and difficult performance keeping us on track by flipping hats between his adult role and childhood role. He was the focus, with the most lines to read, along with change in voice and character for each of his roles. Donna Rettew who played Mom, made her part work well. She was the helpful mom, stern when she needed to be with the kids, and with Dad when he tried to take control when she was driving. Her being embarrassed, not remembering where she left Dad's ashes, the Amish scene, and the driving scene allowed her to show to show us her acting. Denise Kus played Sis. I think she had the most interactive character of the bunch . . . the trouble maker. She played her part well, by acting "the innocent Sis" part, and by being sweet to Dad to get her way. I really liked her when she made the faces when picking on Don, then making it look like it was all Don's fault. Oh, the memories . . .
Sherry L. Sweeny played Woman 1. A lot of changing of character and dress, and I can only imagine very quickly. Not only do these additional parts require a speedy delivery, they also require the actor to be in total character for that moment. Changing from one to another, does tend to spin your head. Sherry kept her head on, and provided a great performance in the Civil War reenactment scene. Of course you cannot forget her presence in the diner either. However, the most powerful scene for me was at the end, when the hog farmer walked Don to the center of the country pole, telling Don about the farmer's father and how appreciative the farmer was, knowing what Dad did for him. My friend Cleo "Michelle" Milan who played Woman 2, I am really proud of too. This was her first time performing at the Towle Theater, and I hope it will not be her last. Like Sherry, she had many characters to change to. The one that struck me as the most different, out of all the characters, was her part in the Civil War reenactment. Though differently simple, that simpleness was perfectly brought to us, liking and laughing all the way. I do thank the cast for their energy and performacne. They brought the meaning of family events back to me, using the voice of the writers, and the cast skills as artists. I do believe every member of the audience went away moved, thinking about their lives, as the play intended. It took everyone to pull it off, and most of all, the people who started this . . . the writers. If you desire, check out my blog on Ordinary Days, The 39 Steps, and Next To Normal at the Towle Theater. Again, this year has been a great experience for me. I thank the Towle Theater for being a very large part of that, starting with "Ordinary Days" and ending with "Leaving Iowa". This is the first for me, as many other firsts this year, photographing musicals and plays. I hope I will be invited back for next season . . .
9/11/12 - Could not resist another photo opportunity. I saw this car with Iowa License plates in the parking lot when visiting David Mueller at Paul Henry's Art Gallery. So I took the photo with the Towle Theater in the background.